Blazer total metal jacket, aluminum case 9x19 range ammunition is still innovative decades after their debut. 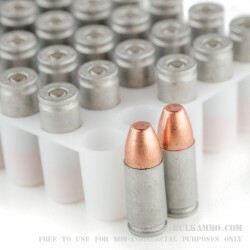 The cheaper, easier to clean up alternative to brass cased, reloadable ammunition fills a very big need for the general market. Some people don’t plan on reloading and want to shoot cheaply. For those who know what they are getting, this is an excellent load. The aluminum case is more than strong enough to handle a single loading, and the price is right. Blazer is a pretty clean shooting cartridge in 9mm and the reliability is excellent. 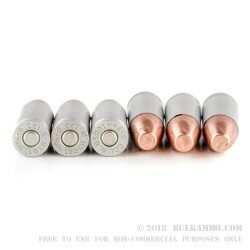 For guns that struggle shooting steel cased rounds, the Blazer generally will still work as the aluminum is easier to push through the tighter tolerances that the rounds are hanging up on. 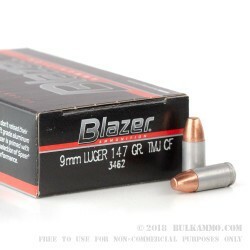 A relatively standard 147 grain load that is made purposefully to be able to cycle modern firearms in 9mm Luger, this ball ammo has a slight squaring to the tip of the projectile and generally does not have any feeding concerns. CCI components have a great history of reliability in ignition and in feeding and the shooters who want to leave the spent casings on the ground don’t have to feel bad about not reloading.